After a few days, I have finally finished reading Productive Pinoy by Yeng Remulla. And all I can say is that it is indeed worth my time. I have been an avid reader of self-help books and most of them were written my foreign authors. This one has different impact on me because it was written having my own culture and feelings in mind. As a parent, I love how Productive Pinoy tackled the issue on how some parents (people) tell their children (us) that they are useless (walang kweta). Most children (us) grew with the subconscious mindset that they are indeed useless thus hindering them from being achievers. Biblically speaking, this is true. The Bible said that the tongue has the power of life and death. So if we continue saying that our children are useless, indeed when they grow up useless because of their subconscious mindset that we have created. Thus, the book Productive Pinoy, reminded me that as a parent I must make a “conscious” effort to tell my children that they are productive, resourceful, talented and many more. As a blogger/online entrepreneur, the book Productive Pinoy reminded me to work smart and productive, not work hard and sleep late (in my case, never sleeping, LOL). It made me aware that being productive and successful does not entail long working hours (sacrificing time with my children even if I am a work from home mom) but of working smart, planned and organized. So it made me realized that even how chaotic life for me right now, I can still plan and get everything organized. Age doesn’t limit what I can do and achieve… just plan to make it right! The book, Productive Pinoy, has touched me more than what I can write right now. It has awakened my senses and realizations in life, as a mom, as a wife, as a blogger/online entrepreneur and as a person not only for others but for my own and my entire well-being. 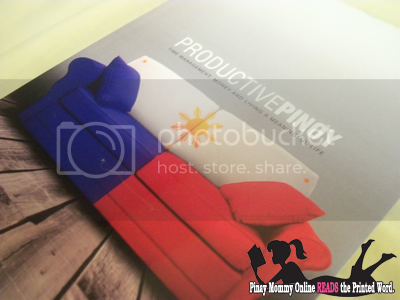 Productive Pinoy is indeed a great read that I can recommend to anyone and everyone! Yeng Remulla (Sounds familiar? Well, he is the keyboardist of True Faith, one of my favorite Pinoy Bands when I was a bit younger) is not only an awesome young man that is full of wisdom beyond his years. Like their Facebook Page at https://www.facebook.com/iamaproductivepinoy for more info. Looks like a helpful book. Joining the giveaway. Interesting! Here I am, trying my luck again! Hay naku nakajoin na ako Ate Rubz bago nabasang for Philippine residents only, di bale may adrez naman ako diyan., haha :laugh: Thanks! I am joining this, as I want to be a Productive Pinoy! Joined the giveaway! I think the book is really interesting! I liked to get my hands on the book and read it. I am definitely joining. I hope I will win! looks like an interesting read, joining your giveaway mommy! Hi Mommy Ruby, joined your giveaway. I always drop by the bookstore to look for new interesting books that are affordable but with lessons that I could apply in real life. Hope to win this. I could learn a lot from this book. More Power! Joined the giveaway! A book lover here! I hope I’ll be able to have this book soon! Joined na mommy… I hope manalo ako… God Bless. Sadly, I can’t find this book in the nearest bookstore in our place. Hopefully I can visit NB at SM to find this book. i find it very much interesting to read. Too bad I wasn’t able to join this one. I’ll just grab a copy in the bookstore.